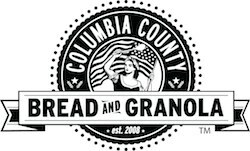 Columbia County Bread and Granola is on a mission to redefine bread. The company is five years old, and exploring ways to make their products and their business as healthy as possible. For the business, this means trying to find sustainable ways to work and grow. For the bread, this means perfecting a sourdough loaf made from sprouted grains. “There’s just more and more evidence out there that tolerance to gluten has a lot to do with a fermented sourdough starter,” said founder Doug Michael, who has been pursuing a new route to bread for some time. The cartoonist, who has also adapted his work for theater, got Lyme disease in 1995. As he was recovering, he discovered Weston A. Price and his advocacy of sprouted grains. Eating a lot of Ezekiel bread got him wondering if he could make this type of bread. There were not a lot of recipes for sprouted grain breads available in 2000, when he started experimenting. Still, after years of fiddling, he worked up a formula that satisfied him. The bread became a business when his girlfriend got a job at Bloomsburg University, and he started to sell at a farmers market in the small city. Doug baked in the kitchen of a former Moose lodge that is now a community center. As the business grew, he hired people to help. One of them has become very central to the enterprise – Michael Perakovich. “Like me he needed an obsession so I gladly passed it along,” said Doug. Perakovich has a background in painting, sculpture and ceramics, and he approached the bread with an equally deep and artistic fascination. He’s so disenchanted with what he sees flour doing to people’s bodies that he worked on making the bread without flour, applying the principles of flour based bread baking to sprouted whole grains. Once he got rid of flour, he decided to get rid of chemical leaveners too, and developed a sourdough on sprouted whole wheat berries, the same basic ingredient for the bread. “Phytic acid is naturally found in grains because grains are trying to protect themselves from people trying to eat them,” said Perakovich, explaining one of the benefits of sprouting. Some say phytic acid makes whole wheat bread worse than white bread, interfering with the body’s ability to absorb minerals. Sprouting and sourdoughs will interrupt these negative effects on nutrition. In other words, you won’t want to add flour to dough. Over the last 2 years, Perakovich has immersed himself in the bread, and he speaks frequently about what he’s learned. He and Doug Michael travel to lots of different groups to educate people about what they’re doing, trying to steer conversations that fret about bread and wheat to the sprouting and fermentation processes that distinguish their foods from others. Word traveled like wildfire when their granola was featured on the Dr. Oz show in January of this year. Lyn-Genet Recitas is a nutritionist and author of The Plan, which features Columbia County sprouted granola. That kind of attention isn’t easy for any small business to handle. They had to revamp their website, ordering setup, and bring in new equipment, which meant rewiring the kitchen. Despite these dramatic terms, Columbia County Bread and Granola is pursing that goal gracefully. Healthy foods start with healthy companies, and the employees have a guild to handle internal problems themselves. Michael and Doug are investigating ways to make the bread a more commercially viable product. Current production methods are very labor intensive and expensive. The sprouting process is done by hand, using small tubs. Soaking, draining and grinding the wheat is all done by people, and the time spent handling the bread really adds up. The thought is that these crews can be taught how to make the bread, and the company would license the process to the people who use it. Another route to sustainability is more mechanization. Ben Franklin Technology Partners and NEPIRC (Northeastern Pennsylvania Industrial Resource Center) are lined up to help solve some of these problems. Both organizations offer combinations of financial and technical assistance. Ben Franklin has approved their loan application and will pair them up with the Learning Factory, a group of engineering students from Penn State that will offer engineering expertise at a very reasonable price.